Some interesting statistics come out of the life of an aircraft engine. It may pull an airplane at 145 miles per hour, turn at 2400 revolutions per minute, and have a rated lifetime of 1,500 hours while burning 15 gallons of aviation 100 octane gasoline for every hour of flight. Thus, over the life of one engine, you can expect a Cessna 206 like mine to fly for 220,000 miles -- the distance from the earth to the moon -- and will burn over 22,000 gallons of fuel doing it. In contrast, a typical household burning 400 gallons of heating fuel a year, would take 55 years to use this much fuel. 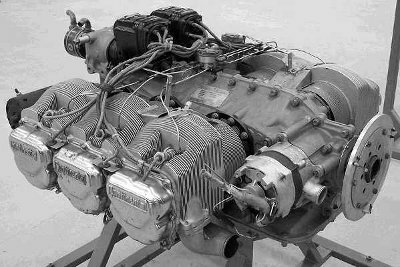 The IO520F engine has hundreds of parts. The crankshaft is one solid forging with pressed inserts, threads, passages. The aluminum engine block is in several parts that bolt together, with associated bolts, nuts, washers gaskets and studs. The pistons have 4 rings; each cylinder has two valves with springs, rocker arms, shafts, pins, bushings, circlips. There are ignition magnetos and fuel injectors. The engine drives a seven foot diameter propeller, engine, propeller and components add up to over 500 pounds. Each revolution of the engine has three cylinder firings. There are 216 million turns of the engine during its life for three quarter of a billion firings! It is incredible that such a machine can run for so long, endure the abuse of the millions of flexings, rubbings, and poundings. Yet it does. And it does it day after day, after day. Unless something happens. This is the story of one such Engine. On December 24, 1984, I was chartered by Dr. Dan Stang and his family to fly them from Nome to Council, about 65 miles to the Northeast. The day dawned dark and cloudy, with light snow falling. It did not look like a good day to fly, but I thought I would give it a try. The pasengers, Dan, his wife Annie and their kids piled into the plane, along with a Labrador dog and some baggage. I taxied to the north end of the Nome City field airport, and aimed the Cessna along its 3900 ft length of gravel. Feeding in full power, I took the plane to takeoff speed and lifted off over downtown Nome, Alaska. The engine ran well, but the weather sure looked worse than I was hoping for. I turned left, and pointed the plane at Council. Out of the corner of my eye I saw something alarming. The oil pressure, normally at 50 psi on the gauge, took a nose dive and settled at 20 psi. This clinched it. I continued the left turn, and reentered the traffic pattern for the runway. As I landed I told the Doctor that I was sorry, but this flight was not going to come off today. It was just "The weather is just too thick." They bought the story, and spent Christmas holidays snug in Nome. I never revealed to them the true reason for returning to Nome. I covered up the plane, and did not return to it until next day, December 25. Chuck Wheeler - a very capable mechanic - and I, started the engine up. It still read 20 psi. I called a friend of mine in Anchorage, who agreed to send me a new oil pressure regulator by express. Chuck and I checked everything we could, but the engine looked fine. There were no metal particles in the oil screen, or on the filter. The engine ran smooth and developed full power. We were convinced that the oil pressure regulator had gone bad. Next day, December 26, the critical part arrived on Alaska Airlines. We went ahead and installed it, also calling on the services of Joe Kowchee, another fine Aircraft Mechanic. As I also hold a Mechanic license, there were three sets of eyes and brains working on this motor. The part was replaced, the engine started and the pressure came up to 40 psi. A bit low, but definetely much higher than before. A couple of turns of the pressure adjusting screw, and it was right there at 50 psi. Perfect! In those days, I lived in White Mountain, about 60 miles east, and not too far from Council. I buttoned up the plane, and went to the company apartment to do some paperwork. No passengers materialized, and I wanted to go home and sleep in my bed. So about 10:30 pm I loaded a light duffel bag, some food, and took off for White Mountain. Water is somewhat hard to get in the village, so I was also carrying two, 5 gallon jugs of water. Packing my water this way is something I did often. The takeoff was uneventful, the weather was still marginal, about 900 ft overcast with a breeze from the north. I pointed the plane east and eased it into a climb until I broke above the clouds at 6,000 feet. The stars were out, a beautiful, diamond studded night. I leveled off at 9,000 feet and called White Mountain on the company radio. "Tiny", the dispatcher in White Mountain answered my call, and I told her I would be home in about 20 or 25 minutes. I settled in for the flight, the Direction finder homing in on the strong White Mountain radio beacon, 269 kc/s, "EWH". About fifteen minutes into the flight I was halfway to White Mountain, when there was this loud bang from the front of the plane! The engine had blown up! Indeed, pieces of it had not only made holes in the engine block, but pierced the top of the engine cowling. It was absolutely terrifying to see some pieces pulsing up and down on top of the cowl. But ... the engine continued to run. Yet, it was vibrating alarmingly, and I reduced power until it smoothed somewhat. I also called White Mountain, and gave the Mayday call. "White Mountain Radio, White Mountain Radio, this is 60523, Mayday, Mayday. I have blown something up in the engine, I am turning around for Nome, and will be changing radio channel to the FAA's." "Tiny" immediately answered and wished me godspeed. I called Nome Radio and explained my problem: "I have reduced power, but the plane is not maintaining altitude at this power setting." The FAA operator acknowledged and mobilized Nome Search and Rescue. Within minutes about 300 vehicles had mobilized ... incredible. But, I was going down. Oil pressure was Zero, and the oil temperature had pegged at the top of the red arc. The motor was failing fast. The propeller started to speed up due to lack of regulating oil, yet the motor kept running. Once in a while it shuddered and I had to reduce power further. Soon I entered the top of the clouds. Here I was, in instrument conditions with a failing engine. I looked outside to see nothing but darkeness, and the glow of my red and green wingtip lights reflected in the swirling clouds. My radios were locked to the Nome navigational VOR. Was I going to make it? If not for the banging and churning engine up front, you would think this was a nice, normal flight. Yes, I was on instruments, but the flight was so steady, that someone might be fooled. But as I descended below 4,000 feet, the oil temperature all of a sudden started to drop ... until it hit the stop at the cold end of the dial. This did not mean that things had started to cool off, but ominously indicated the complete stoppage of oil flow past the temperature probe. The engine, in fact, was destroying itself. But, in spite of it all, it kept running. And it flew me closer and closer to Nome, away from the broken and hilly terrain below. I was minute by minute getting closer to safety, if not by preventing a crash, but by coming closer to the rescue teams that were assembling. At 3,000 feet I guessed I was somewhere between Cape Nome and Nome, relatively flat terrain except for a few pesky radio towers. Those could be pinpointed by radionavigation, so, in fact, they were not a hazard. The plane now descended below 2,000 feet. There! On my instrument panel my VOR indicator told me I had just flown over the VOR station, just 5 miles from the Nome airport! And I now descended below 1,000 feet. The plane emerged from the cloud cover ... there in front of me was a fantastic sight! The two roads ahead looked like the LA Freeway. It was bumper to bumper with automobile lights, in both directions, flashing red and blue lights, signs of police, state and fire department vehicles and volunteers. I could see, here and there, snowmachines heading in my general direction. Even though I was alone in the airplane, this was still an Air Carrier flight, and Nome had totally mobilized itself. I could see I was not going to make the main airport, and, I would not want to try it because the approach would be over the City. I had to remain clear of buildings and powerlines. As the airplane descended below 500 feet, I estimated that with some luck I could make the smaller City Field airport I had departed only half hour ago. I turned a bit to position myself for that eventuality, but the engine started to run rougher and rougher. It would not do to reduce power or I would not make that runway. Rather, I started to think about things like: "The engine is breaking up and inhaling a lot of air. That must be leaning the fuel mixture out. If I were to add a bit of fuel, things may smooth out, or even give me a boost." Without further ado, I eyed the Mixture Control. This was already on Full Rich, so I decided to flip the electric fuel pump on LOW setting. From experience I know this would add a couple of gallons per hour to the mixture .... just right. So I flipped the switch. Bad choice. The engine instantly gave one big shudder and seized. The silence was deafening, my altimeter read 400 feet. I was past the "Beam Road" but short of the Icy View subdivision. What sort of terrain awaited below? I picked up the microphone and told FAA "This is 60523, the engine has seized, I am now turning into the wind." FAA acknowledged, and thankfully did not ask anything of me, leaving me to fly this plane. The rate of descent increased dramatically. I levelled off heading North at about 250 feet, and turned on my landing lights. These are twin headlamps, one being 100 watts, and the other one having been modified to a 330 watt bulb. It lit the landscape like a torch! There ... just a bit ahead and below me was what looked like a flat spot with the tips of grass or vegetation showing through the snow. I selected full flaps on the plane and plonked it down on that level spot. With a slight bounce, the plane rolled forward about 200 feet and came to a stop. Silence greeted me. The plane was on its feet, not having obviously wrecked. My red beacon light on the top of my tail was flashing, and in the distance I could see the headlights of snowmachines heading my way. I kept the electrics on, but turned off the landing lights. I stepped out of the plane. With a flashlight I made a quick examination. There was no discernible damage, as later inspections confirmed. The propeller was not bent, nor had it hit the ground. The landing gear was intact. A miracle in the arctic! I went to the rear of the plane and started emptying out the water jugs and buttoning things up. Keith McDaniels was the first one to reach me. "Need a ride, Ramon?!" Just like if this was an everyday event. I turned off all the switches, closed the doors, and climbed in the back of his machine and in fifteen minutes I was in Nome, at the Bering Sea Saloon with a beer in my hand and a totally packed crowd of rescue workers all patting me on the back. My hands were still shaking; in fact, my whole body was aquiver with emotion. I just could not believe the outcome of my flight, the lack of injury or damage, and the tremendous outpouring of help rendered by Nomeites. The airplane was put on temporary skis and towed to Nome. The engine and propeller were changed for new ones. I replaced the nosewheel just in case, as well as all bolts securing the nosegear to the plane. Why take a chance? It was a rather abrupt stop! The engine was completely destroyed. On the top of the block, just over the left, rearmost cylinder, was a hole big enough to put both hands through. This cylinder, the #5, had broken a rod bearing bolt, loosening the bearing and no doubt causing the earlier diminution in oil pressure. During the last flight, the other bolt had snapped off. The connecting rod had been swallowed into the fury of the spinning crankshaft and broken off and thrown out in pieces out the top of the block, and a few other small breaks in the case. But the pieces rattling in the engine did not all get ejected. Some mashed into the remaining portions. None of the cylinders could be removed from the block because their bases had been peened, mushroomed, by the hammerblows of the parts. The lack of oil flow had caused all main and rod bearings to melt away. Eventually the crankshaft was spinning without bearings. Molten metal instead became the bearings. You could take a pencil and insert it between the crankshaft and the journal bosses on the case. This was over a quarter inch of clearance all around each and every main and rod bearing. Molten aluminum slag laid thick on the bottom of the oil pan. Incredibly, no siginificant amount of oil had been lost ... it just would not flow anymore because the oil passages were clogged with debris. The pieces coming out the top of the engine had struck the left Slick Electro magneto, and broken its housing. But the engine continued to run on the other magneto and its separate set of sparkplugs. The fuel injector lines were bent, but not broken. The #5 cylinder had cocked itself on the case, bent the exhaust and strained the intake manifold .... but the rubber tubes that couple the intake sections together took the bend without leaking air. There was no salvage. The propeller was full of metal particles and was junked. The governor was likewise damaged, and the remaining magneto had a loose shaft due to oil contamination. None of the cylinders were salvageable. The Starter and Vaccum Pump and oil cooling radiator were likewise full of particles which had damaged them. The engine was laid on the floor of our storage building, where it rested for a year or two. Somewhere along the line a friend stumbled over this engine and remarked: "Ramon, why don't you take this piece of junk to the dump?" "Junk? $%^$&* Junk! ?," I replied, "this engine is not junk! This is the best engine I have ever owned. I owe my life to this motor!" Author's Note: The above story is true, including names, dates, and all data. It is another episode in my life as a bush pilot where I accumulated over 14,000 flying hours.